Le dernier numéro de Current Opinion in Psychology vient de paraître. Il porte sur les relations de couple et le stress. Relationships and stress (Volume 13, Pages 1-162 (February 2017)). Edited by Gery C. Karantzas, Jeffry A. Simpson and Marita P. McCabe. Deux articles portent sur les TCC de couple (pdf) et l’IBCT (Integrative behavioral couple therapy) (pdf) que je pratique avec les couples. What constitutes effective communication during conflict? Answering this question requires first, clarifying whether communication expresses opposition versus cooperation and is direct versus indirect; second, assessing the mechanisms through which communication effects relationships; and third, identifying the contextual factors that determine the impact of communication. harmful when partners are not confident or secure enough to be responsive. beneficial when problems are minor, cannot be changed, or involve partners whose defensiveness curtails problem solving. 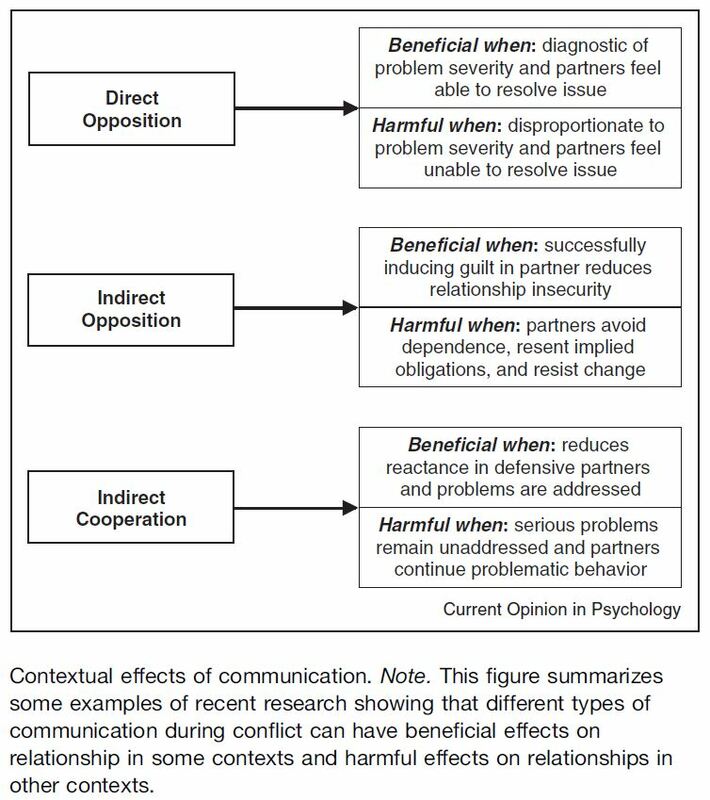 Clinical researchers pioneered the investigation of communication during conflict with the aim of distinguishing distressed couples embroiled in intractable disagreements from more satisfied couples. Not surprisingly, hundreds of cross-sectional studies in this tradition revealed that dissatisfied couples exhibit greater disagreement, hostility, and criticism compared to satisfied couples who express greater agreement, affection and humor [10–14]. and assumed ‘positive’ communication is beneficial. and humor undermines satisfaction and stability [15,16]. so fail to motivate partners to change [15,16,20]. and then second, test whether these types of communication actually do facilitate problem resolution across time. First, we have measured different types of communication that vary according to the two dimensions depicted in Figure 1. The vertical dimension captures what has been traditionally understood as ‘negative’ versus ‘positive’ communication and specifies whether communication expresses opposing or contrasting goals and motivations (opposition) versus cooperative or aligned goals and motivations (cooperation). (indirect) with regard to the problem and how that problem can be improved. 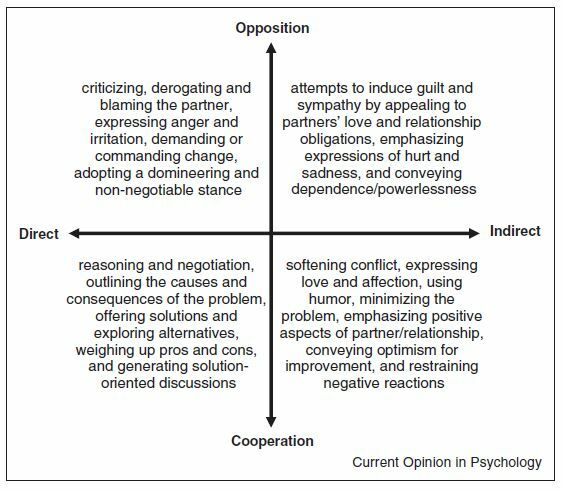 and indirect cooperation (e.g., softening conflict via affection). partners are not confident or secure enough to be responsive. a catalyst for building healthier and happier relationships.